Rate this project Alessio Fattorini has announced the release of NethServer 7.5. The NethServer distribution is based on CentOS and provides a friendly, web-based administration panel. The project's latest release includes the Fail2Ban security software, the ability to set up wi-fi hotspots and more flexible control over software updates. "We have deployed a new panel to manage the software center. It allows to select how NethServer deals with upstream updates and configures automatic software updates. The Locked policy is selected automatically when CentOS releases a new minor version. It limits updates to repositories specific to the current version When NethServer is ready to upgrade, the new upgrade procedure can be started. The software center section of the Admin's manual was updated accordingly. Read it carefully! Icaro Hotspot - Hotspot's main goal is to provide Internet connectivity via wi-fi to casual users. Users are sent to a captive portal from which they can access the network by authenticating themselves via social login, SMS or e-mail. Icaro is a complete Hotspot written in Go and Vue.js. It uses CoovaChilli as access controller which can be configured and installed inside NethServer." Further information and screen shots of the new features can be found in the project's release announcement and in the release notes. Download (MD5): nethserver-7.5.1804-x86_64.iso (993MB, torrent, pkglist). 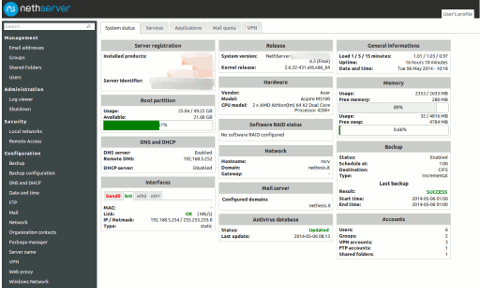 NethServer is a CentOS-based Linux distribution for servers. The product's main feature is a modular design which makes it simple to assign the server various roles. The project's latest release is NethServer 7.6 which introduces multiple backup storage options, Rspamd is included for blocking unwanted e-mail messages and Fail2Ban can track attacker activity inside jails. "Today, we're happy to announce that NethServer 7.6 has been released and is publicly available. This release marks a big step forward for communication, collaboration and security, introducing: Multiple backups, with new storage backends and encryption. New modern look and feel for NethServer user interface (alpha). E-mail: Rspamd is now the default, with quarantine support. WebTop Groupware: CalDAV/CarDAV server, optimized layout for tablets, favorite folder and video calls. Fail2Ban: track the activity of the attackers with new jails. nDPI: performance and security improved. Accounts: easily delete a list of users, DC container upgraded and password expiration management improved." More information can be found in the project's release announcement. Download: nethserver-7.6.1810-x86_64.iso (1,005MB, MD5, torrent, pkglist). Alessio Fattorini has announced the release of a new development snapshot for NethServer, a CentOS-based server distribution. The new development version, NethServer 7.5 RC1, introduces new upgrade settings, new e-mail control and filtering through a Rspamd-based solution, wi-fi hotspots and the inclusion of Fail2Ban in the base system. "Fail2Ban is now part of the core. Fail2Ban scans log files (e.g. /var/log/apache/error_log) and bans IPs that show the malicious signs - too many password failures, seeking for exploits, etc. Generally Fail2Ban is then used to update firewall rules to reject the IP addresses for a specified amount of time, although any arbitrary other action (e.g. sending an e-mail) could also be configured. Out of the box Fail2Ban comes with filters for various services (Apache, Courier, OpenSSH, etc). Fail2Ban is able to reduce the rate of incorrect authentications attempts however it cannot eliminate the risk that weak authentication presents." A complete list of changes can be found in the project's release announcement. Download: nethserver-7.5.1804-rc-x86_64.iso (993MB, MD5, torrent, pkglist). Alessio Fattorini has announced the release of a new version of NethServer, a CentOS-based distribution for servers. The new NethServer release, version 7.4, introduces improvements to Samba and Active Directory integration. The new version also will inform the user when new upstream releases are available. "The new release automatically updates the domain controller and warns on upstream updates. Proxy, web content filter, anti-virus and IPS were updated and got an improved web user interface. In addition, it contains some enhancements (Speedtest in diagnostics panel, new bandwidth measuring, prevent intrusions with rule categories). Last but not least we are proud to present an up-to-date cloud and VoIP server. Account provider improvement: The local Active Directory account provider is now able to apply updates to the Samba DC instance automatically. The latest provided Samba DC version is 4.6.8. More features: Besides local active directory NethServer supports remote AD and LDAP(local/remote). IP changing possible. Account provider changing from LDAP to AD and vice versa is supported." Additional information can be found in the distribution's release announcement and in the release notes. Download (MD5): nethserver-7.4.1708-x86_64.iso (857MB, torrent, pkglist). NethServer is a CentOS-based Linux distribution for servers. The project provides many optional modules and a web-based administrator interface to make setting up services more convenient. The project has released a new development snapshot, NethServer 7.4 Beta 1. This update features mostly small changes and bug fixes from the parent distribution: "We are proud to announce a new NethServer release. NethServer 7.4 Beta 1 is here, just 7 days after CentOS 7.4 release thanks to the amazing work of this wonderful community! The beta release contains all the features of NethServer 7.4.1708 in a form that anyone can help test. This testing, guided by the NethServer team, helps us target and identify bugs. This release is still not ready for production servers! Squid has been patched for a smoother web navigation experience when using SSL transparent proxy. Ntopng 3 replaces bandwidth, the Server Manager has a new 'top talkers' page which tracks hosts network usage. Suricata can be configured with multiple categories rules EveBox can report traffic anomalies detected by Suricata Many updates from upstream." Additional information on this beta release can be found in the project's release announcement. Download: nethserver-7.4.1708-beta1-x86_64.iso (857MB, MD5, pkglist). Alessio Fattorini has announced the release of NethServer 6.9. The NethServer distribution is a Linux distribution for servers which is based on CentOS and features a web-based administration interface. The new release features improved support for Let's Encrypt security certificates, version 5 of Shorewall and the ability to import contacts from Outlook 2016. "We're happy to announce that NethServer 6.9 has been released and is publicly available. We're confident that, as always, it will achieve our mission: making sysadmin's life easier with open source. This is thanks to the most vibrant, supportive and friendly community in the open source space (and not just open source). 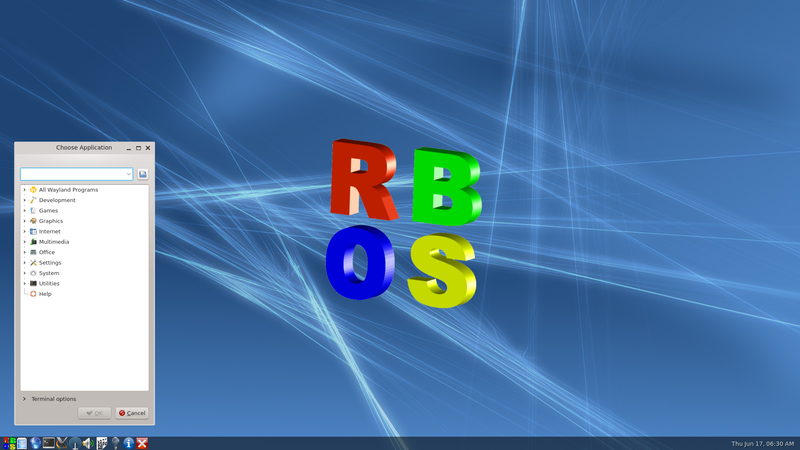 Based on the recently released CentOS 6.9 operating system. The traffic shaping web UI doesn't list VLAN reds interfaces, but it's possible to assign the RED role to a VLAN. Now it's possible to add traffic shaping to red VLANs. Also, creating a port forward, VLAN reds now are listed in the WAN IP (red interface) section." Further information on NethServer 6.9 can be found in the project's release announcement and release notes. Download (MD5): nethserver-6.9-x86_64.iso (495MB, torrent, pkglist). Alessio Fattorini has announced the release of NethServer 7.3. The NethServer distribution is a CentOS-based project for servers and features a modular design along with web-based administrative controls. The new version can use Samba to replace Microsoft Active Directory domain controllers and features centralized account management. "NethServer is now able to act as a Samba Active Directory Controller. NethServer can replace a Microsoft Active Directory Domain Controller Native MS-Windows management tools, like RSAT tools and AD PowerShell are compatible with NethServer Group policies can be deployed through native MS-Windows tools Windows workstations can seamlessly join the AD Domain, no more registry tweaks are needed. NethServer 7 brings a centralized account management (so-called 'multi-site') supporting authentication and authorization against either a local or remote accounts provider." Additional details can be found in the NethServer release announcement. Download (MD5): nethserver-7.3.1611-x86_64.iso (775MB, torrent, pkglist). Alessio Fattorini has announced the release of a new development snapshot for NethServer, a server distribution based on CentOS. The new development snapshot, NethServer 7.3-rc3, is based on CentOS 7.3, increases the flexibility of the administrators group and improves HTTPS proxy handling. "We have changed the behaviour of the Transparent HTTPS proxy dropping the MITM (Man In The Middle) feature that inspects all the encrypted traffic, substituting it with a new implementation that sniffs only the beginning of the connection to discover the destination website (for filtering purposes). We can do this now because CentOS 7.3 introduced squid 3.5 which has a new function to intercept HTTPS connections, called peek and splice. Basically, it means that we peek at the beginning of the connection to discover the destination website (and block it if desired) and then let the traffic flow unaltered from the client PC to the secure website." Additional information can be found in the release announcement. Download: nethserver-7.3.1611-rc3-x86_64.iso (740MB, MD5, torrent, pkglist). Alessio Fattorini has announced a new, and probably final, release candidate for NethServer 7.2. NethServer is a CentOS-based server distribution which is administered primarily through a web interface. The new development snapshot, NethServer 7.2 RC2, supports both long (with domain suffix) and short user names, blocks guest users from writing to the shared folder and includes a number of fixes: "By default, NethServer 7 enables the @domain suffix in user and group names, this new convention confuses the system user, and force to reconfigure his account credentials on any network client. Moreover, some applications require a configuration adjustment and such default is quite different from the previous NethServer version 6.x approach. We have defined an additional option to support both name forms (short, long) and keep all data consistent." Further information and download links can be found in the project's release announcement. Download: nethserver-7.2.1511-rc2-x86_64.iso (784MB, MD5, torrent, pkglist).